People like to read about folks who come first, and Mr. Modi’s visits often claim this honor. Sometimes, such as his trip to Mongolia, because his visit is the first by an Indian prime minister. But in other cases, the firsts come with footnotes. For instance, Mr. Modi was the first Indian prime minister to visit Canada in 40 years on a “bilateral visit” in April, according to India’s foreign ministry. Indian prime ministers have visited Canada in the past four decades, but on multi-lateral or other types of visit. Another twist: Mr. Modi’s time in Australia in November followed a visit of Australia’s then-Prime Minister Tony Abbott to India a few months earlier. The exchange was thus described as the “first time Australian and Indian Prime Ministers have made reciprocal visits in the same year,” according to India’s Press Information Bureau. For his upcoming visit, expect Mr. Modi’s team to point out that he is the first Indian prime minister to visit Silicon Valley, because Mrs. Gandhi only went to Los Angeles. In countries with a large Indian-origin population, Mr. Modi likes to make a big impression. Usually in a stadium packed with thousands of people and supported by a song-and-dance show. Mr. Modi has taken over such arenas in New York, Sydney and Toronto. In the upcoming visit, the big event will be at the SAP Center in San Jose, which is also nicknamed the “Shark Tank” because it hosts ice hockey team the San Jose Sharks. The SAP Center will host Madonna in October. The event’s organizers say they have received requests for around 45,000 passes, while SAP Center can seat only around 20,000 people. One crowd-pleaser that Mr. Modi uses on trips abroad is to announce India will make it easier for foreigners to visit. In February 2014, before Mr. Modi came to power, India’s government pledged to give visas-on-arrival to people from 180 countries, up from 11 countries previously. The expanded list so far covers people traveling to India from the U.K., U.S. and China among others. Mr. Modi re-announced this step as evidence of India’s efforts to make it easier for people to visit. In New York, it got a lot of applause. But, when some tourists tried to get a “visa-on-arrival”, they were asked to apply for it 72 hours in advance. This created confusion. In April, the Indian government changed the name to “e-tourist visas”, saying that tourists could apply for it online. During his overseas trips, Mr. Modi’s selfies with other leaders including Li Keqiang, the Chinese premier, have received a lot of attention online. Most recently, Mr. Modi took a selfie with ministers of the United Arab Emirates . From the upcoming trip, look out for selfies with Mark Zuckerberg, chief executive of Facebook Inc. who is meeting Mr. Modi, and other high-profile Silicon Valley execs. The icing on the cake of a good trip abroad for Mr. Modi is the unveiling of a bust or statue of Indian independence leader Mahatma Gandhi. Mr. Modi unveiled the bust of Gandhi in Hannover, Germany, and in Turkmenistan’s capital Ashgabat . He inaugurated a statue of Gandhi in Brisbane, Australia, and another in Bishkek, Kyrgyzstan. In China, Mr. Modi inaugurated the Center for Gandhian & Indian Studies at Shanghai’s Fudan University. On his most-recent trip to the U.S. in September 2014, Mr. Modi visited a statue of Gandhi in Washington. Mr. Modi’s U.S. hosts haven’t included a Gandhi unveiling for the upcoming trip however. The focus of the prime minister’s visit to Silicon Valley will be on technology, startups and innovation, said Khanderao Kand, convener of the Indo American Community of West Coast. Pristine beaches, blue skies, it’s not hard to imagine why Indian Prime Minister Narendra Modi would want to stop by the island nation of Fiji after a hectic few days at the G-20 summit in Australia. But there’s another reason Mr. Modi has made the newly-minted South Pacific democracy his final port of call during a three-nation tour that concludes Thursday: China. In 2012, there was an influx of Chinese investors and companies expressing and registering their interest in setting up businesses in Fiji, according to Investment Fiji’s annual report for the year. Chinese investors accounted for 20% of the projects registered by foreign companies in Fiji in 2012, while Indian investment accounted for 10%, the report said. 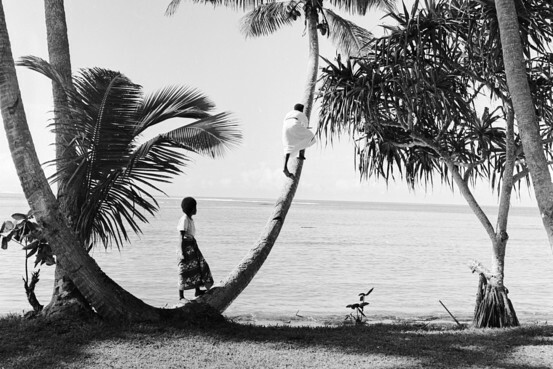 China has tried to raise its profile across the South Pacific over the past decade. The 12 South Pacific island nations that make up the region are much less populous than other parts of Asia, but have vast fishing grounds and potentially large deep-sea mineral deposits. Chinese companies have bought stakes in Fiji’s largest gold mine and invested in its bauxite industry. Foreign direct investment by Chinese companies in Fiji accounted for around 37% of the value of projects registered this year, compared with just 2.9% in 2009. Trade figures from Fiji’s Bureau of Statistics show that India lags far behind. In 2013, China exported $27.29 million in goods to Fiji, compared to $4.76 million imported to the island from India. via Narendra Modi Is in Fiji. This Map Shows Why – India Real Time – WSJ. 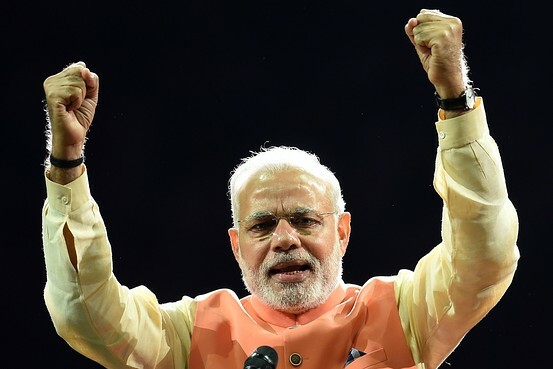 NOT since Indira Gandhi has a prime minister of India been as dominant as Narendra Modi. His clout comes from the big electoral victory in May of his Bharatiya Janata Party (BJP) after a remarkably personalised campaign; from a hyperactive prime minister’s office that makes Mr Modi look presidential; and from an opposition Congress party in tatters. But even the mightiest cannot rule alone, and Mr Modi relies on two old allies, both crucial. One, Amit Shah, engineers the electoral victories that give Mr Modi his authority. The other, Arun Jaitley, must take that authority and out of it craft policies and decisions that will launch the economic recovery which Mr Modi has promised and by which he will be judged. These two men are Mr Modi’s enablers. Now the BJP’s president, Mr Shah is a master of the dark political arts—indeed, his hooded eyes give him the air of a pantomime villain. He has served Mr Modi for nearly three decades. The pair collaborated in the state of Gujarat, where Mr Modi won three elections and ruled for a dozen years. Mr Shah had charge of ten state ministries, including home affairs. Long an outsider in the urbane circles of Delhi’s national-level politics, Mr Shah is uncomfortable in English and rarely gives interviews. When he makes an exception, as he did after state-assembly elections this month in which the BJP seized control of Maharashtra and Haryana, he mostly uses the time to extol his boss. Of himself, he says merely: “Sometimes you get more credit than you deserve.” Mr Shah is too modest. He ran both state campaigns, just as he crafted the BJP general-election success in India’s most populous state, Uttar Pradesh (UP). That victory was at the heart of Mr Modi’s national triumph in May. Mr Modi stirs voters, but the alchemy of Mr Shah, who turned 50 this week, is to convert popularity into power. In UP the BJP’s share of the vote was 42%, compared with Congress’s 7.5%. That translated into 71 out of 80 of the national seats from the vast state, a golden return. Imbalances between vote share and seats are normal in first-past-the-post electoral systems, but achieving victory in India takes more skill and stamina than elsewhere. Mr Shah makes minute analyses of millions-strong constituencies, imposing candidates and recruiting volunteers early, often from the Hindu-nationalist RSS organisation, where he and Mr Modi were once leaders. He tailors messages according to the audience. He has, variously, presented Mr Modi as a bringer of good economic times, a Hindu strongman and a figure of humble caste. Mr Shah has turned Hindus against Muslims (notoriously, he told Hindu Jats in UP to take electoral “revenge” following communal riots in late 2013). But he has also taken advantage of Shia Muslim antipathy towards Sunnis (in Lucknow, UP’s capital). Mr Modi’s campaigning certainly helps. He led 38 rallies in the recent state elections. Congress’s Rahul Gandhi showed up for only ten. 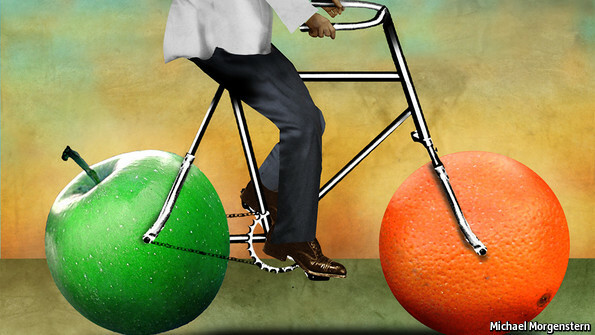 via Banyan: The enablers | The Economist. Since becoming prime minister, Narendra Modi has performed in New York’s storied Madison Square Garden and played drums on stage in Japan. His next big-ticket venue: Sydney’s Allphones Arena this November. Mr. Modi will address what is expected to be a sell-out crowd at the 21,000-seat venue in Australia’s financial and commercial capital on Nov. 17 during his four-day trip to the country for the G20 summit in Brisbane. Organizers say it will eclipse the prime minister’s biggest gig so far, when he spoke to a crowd of 18,000 people, mostly Indian-Americans, at Madison Square Garden on Sept. 28. “This will be bigger and better,” said Balesh Singh Dhankhar one of the organizers of the reception for Mr. Modi. The Allphones Arena, built for the 2000 Olympics, “has more grandeur” than Madison Square Garden, he added. The stadium in Manhattan is famous for hosting some of the biggest names in entertainment, like the Beatles, Bruce Springsteen and “The Fight of the Century” between Muhammad Ali and Joe Frazier. The Allphone Arena also hosts musical acts and boxing matches. In the same month as Mr. Modi’s visit, The Rolling Stones and Katy Perry will play the arena and an Ultimate Fighting Championship event will take place there. Australia is home to around 350,000 people who were born in India, according to the latest census data from 2011. That was a 90% increase on the number recorded in the census in 2006, but a tenth the size of the Indian-American community in the United States. After Mr. Modi’s speech in New York, people in Australia began asking when he would come here, said Mr. Dhankhar, a spokesman for the Indian Australian Community Foundation that is helping put on the event that was conceived only three weeks ago. Some 14,000 people have registered in the first two and a half days of registration, according to the organizers. It will be broadcast live on Indian television channels. “We invited Mr. Modi and said the Indian diaspora in Australia is very eager to see him,” Mr. Dhankhar added. 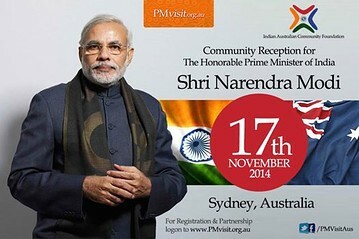 via India’s Narendra Modi to Star at Sydney’s Allphones Arena – India Real Time – WSJ. NO ONE doubts that Narendra Modi, India’s prime minister (pictured), is a capable speaker. On September 25th he called together hundreds of diplomats, business leaders, journalists, ministers and others to a swanky hall in Delhi to launch his latest marketing push. The event was broadcast live across India and to diplomatic missions abroad. A remarkable cast of industrial heavyweights were called on to show support, including Cyrus Mistry of Tata Sons, Reliance’s nervy-sounding boss, Mukesh Ambani, the chairman of Wipro, Azim Premji, the chairman of Aditya Birla Group, Kumar Mangalam Birla, and the chairman of ITC Limited, Yogesh Chander Deveshwar. Over the course of two hours these business cheerleaders, along with ministers and then Mr Modi himself, took turns to explain why it would be a great thing if industrial production, in particular labour-intensive manufacturing, could blossom in India. They are absolutely right. India needs to create lots of jobs—perhaps 1m additional ones a month—if it is to employ its booming population. One speaker suggested 90m manufacturing jobs could be created in India over the next decade. Mr Premji set out how Wipro—better known for IT—has five manufacturing units in India (they make hydraulic cylinders) and overall relied on a broad network of 1,200 Indian suppliers, meaning lots of jobs created indirectly. Mr Birla spoke of a new high-end aluminium manufacturing site in Odisha (formerly Orissa) which now does quality work for the firm that used to be done in a British factory. A representative from Lockheed Martin, an American defence firm, explained how its factory near to Hyderabad makes component parts for its global production of the massive C130-J Hercules plane. A stronger manufacturing sector could help in a host of other ways, suggested speakers, linking India into global supply chains, boosting exports, helping to reduce the current-account deficit and so on. Mr Ambani concluded that India’s economy could boom in the long run, at a sustained rate of 8-10%, growing quicker than China, if only the right conditions were created. All this looks and sounds attractive. So, too, do a flash new website that Mr Modi inaugurated, a new symbol—a lion made up of cog-wheels—and some new brochures that set out how India is a bit more welcoming to manufacturers. But was the exercise anything more than a PR event? As one cynical member of the audience grumbled, it seemed to be a big palaver for the launch of a few marketing tools. 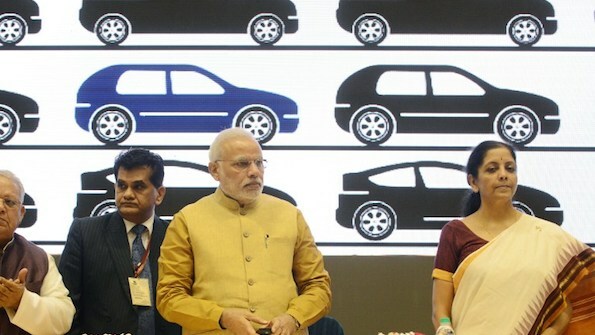 What has actually changed in India as Mr Modi pushes manufacturing? First, discount the worst gush from business leaders. The likes of Mr Ambani and Mr Deveshwar may be embarrassed to be reminded of how sycophantic they were in Mr Modi’s presence. Mr Ambani waffled on about being “blessed with a leader”, the “unique leadership quality of a prime minister, a man who dreams and he does”, who has apparently motivated a billion Indians to “dream and do”. Mr Deveshwar was even more craven, thanking “the Almighty” for the leadership “given to us” in Mr Modi, for “your astuteness, your wisdom…Sir, I’m profoundly inspired by the boldness of your vision and the simplicity with which you have communicated.” Mr Modi sat stony-faced as they fawned. But he probably agrees with the implied message: that most of what it takes to boost manufacturing in India is strong leadership from him, as he showed when he was chief minister of Gujarat. Indeed, when he spoke, he referred back to his success in Gujarat, saying that with the same civil servants and resources as the rest of the country, he had produced striking industrial successes. He expects more of the same in the country as a whole. Sadly, leadership alone will not do it. Matters are more complicated than that. 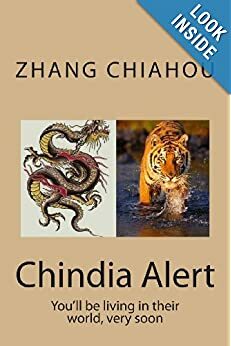 Mr Modi, endearingly, admitted in his speech “I am not a big economist” while urging investors not to think of India only as a big emerging market, but also as a place for production. As he suggests, achieving that requires progress in a host of areas. He spoke of an urgent need for skills development as far too many of India’s youngsters are poorly prepared for globally competitive work (though that is a huge mission, since it means fixing a rotten school and university system) and identifying 21 clusters for industrial development. He spelt out how infrastructure would improve (but not where massive capital to fund that will come from). Laudably, he emphasised the need to make India a far easier place to do business by scrapping red-tape and oppressive rules, mentioning a recent meeting he had with the World Bank to discuss India’s awful ranking—134th—on its annual “ease of doing business” assessment. Mr Modi thinks India should aim to be ranked much higher, quickly, in the top 50 countries. via India’s big manufacturing push: Time to make in India? | The Economist. India’s prime minister has launched a campaign to entice investment and promote the country as the world’s next cheap labor economy. The “Make in India” campaign is as much a slick marketing campaign as it is a promise to streamline bureaucracy and make India investor friendly. India’s 1.2 billion people are anxious to see the economy expand and create more jobs. Some 13 million Indians become old enough each year to join the workforce. Modi has been promoting India as the next manufacturing powerhouse. 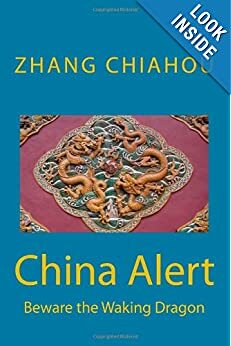 That’s a title long held by China, which is now growing wealthier and pushing toward becoming a consumer economy. via India launches campaign to boost manufacturing – Businessweek. President Barack Obama and Indian Prime Minister Narendra Modi’s meetings in Washington give the two leaders to chance to reinvigorate an economic relationship that both see crucial to growth and security. The two days of talks, which began with a private dinner for Modi at the White House last night, are pivotal, U.S. officials said ahead of the summit. In addition to Obama’s sessions with Modi, Vice President Joe Biden and Secretary of State John Kerry will host today a luncheon for the Indian leader. This is the first time Obama and Modi have met, and it also is Modi’s first visit to the U.S. since he was denied a visa in 2005 over anti-Muslim riots in his state of Gujarat three years earlier. Modi won a landslide election win in May, and the U.S. is seeking to repair relations while India is wooing foreign investors to revive its economy. via Obama-Modi Meeting Offers Chance to Reset U.S.-India Ties – Businessweek. On Sunday, India’s Prime Minister Narendra Modi told a crowd at Madison Square Garden that cleaning up India was his priority. “Mahatma Gandhi never compromised on cleanliness. He gave us freedom. We should give him a clean India,” said Mr. Modi. To honor Gandhi on the anniversary of his birth on Oct. 2, Mr. Modi earlier this month announced the launch of the Swachh Bharat, or Clean India, Mission. “I myself will set out with a broom and contribute towards this pious task” on Thursday, said Mr. Modi in an official statement. Previously called the Nirmal Bharat Abhiyan, the program will be restructured into two separate programs for urban and rural India. Sanitation is one of the most pressing challenges India faces: almost 600 million people defecate in the open in the country. The movement aims to “create a Clean India” by 2019 to commemorate the 150th anniversary of Gandhi’s birth. It’s an ambitious initiative, but viewed as critical to sustainable development in a country that has long ignored the most basic needs of many of its people. As Oct. 2 draws nearer, millions of people across the country are joining daily the cleanliness drives organized by government departments, nonprofits and local community centers. The urban component is expected to cost 620 billion rupees (around $10.1 billion) over 5 years, and includes plans to eliminate open defecation, convert insanitary toilets into pour-flush ones and eradicate manual scavenging. Manual scavenging — the practice of scraping feces out of primitive dry latrines or collecting waste from fields where villagers relieve themselves — has been illegal for decades but still persists in Indian regions lacking indoor plumbing. In urban areas, 10 million households will be provided with around half a million public and community toilets and waste management facilities. In rural India, 1,340 billion rupees (around $21.7 billion) has been pledged to construct around 110 million toilets across the country, said India’s rural development minister in a statement. That’s a lot of new toilets, which if built could help prevent water-borne diseases like diarrhea, which kills almost 100,000 Indian children each year. More toilets could also make women in India safer — in June, two teenage girls were assaulted in the northern state of Uttar Pradesh when, lacking toilets, they had gone outside to relieve themselves in the privacy of the darkness. Mr. Modi has also directed state governments to ensure that all schools have separate toilets for boys and girls by Aug. 2015, according to a government of India press release. Many girls in India quit school when they reach puberty because of a lack of functioning toilets on the premises. 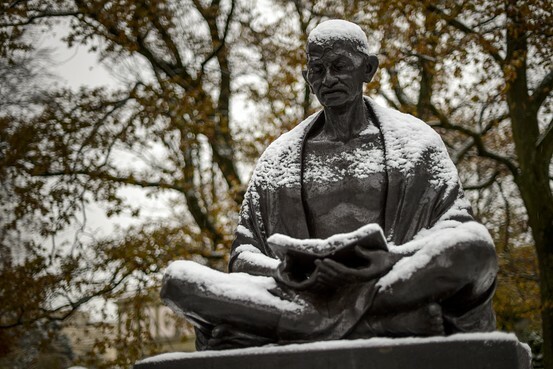 via India Plans to Clean Up for Gandhi’s Birthday – India Real Time – WSJ.